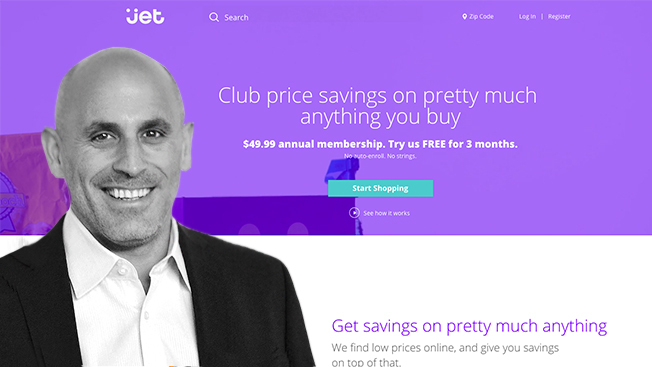 New e-commerce site Jet.com plans to turn advertising revenue into consumer savings. CEO Marc Lore developed the site to get a piece of the potentially trillion-dollar e-commerce market, and to do that, every savings corner will be cut, he says. So, if Jet.com can generate big traffic to the website and eventually earn ad revenue, the money it makes from digital ad sales would go toward lowering prices, Lore said today. Jet.com looks like a slimmed-down version of Amazon, with a wide range of product categories and a promise to sell everything for less than its rival. "We take all the profits and commissions earned from retail partners and give it back to consumers," Lore said. "It's a really unique relationship with the consumer, looking to save wherever you can." It's also a risky business model. Lore has to get Jet.com to $20 billion in revenue by 2020 to make the site profitable. That kind of revenue means it would have to become one of the most successful e-commerce players in the world. The only money Jet.com would make comes from the $50 membership fee users pay to access the savings, which average about 15 percent on everything from detergent to sofas. The site offers deeper discounts depending on variables such as whether a customer pays with a credit or debit card, whether the order can be filled with an efficient shipping route, and whether the consumer waves the right to return items. All these little options help whittle down the price of a basket of goods. Adweek: It's opening day, how's it looking? Marc Lore: Knock on wood, so far, no major hiccups—and sales are rolling in, and there's a lot of traffic on the site. So, how do you keep prices down? We built this proprietary dynamic pricing engine that basically helps retailers pull costs out of the system, which brings lower prices to consumers. … We figure out the most efficient way to get the basket to you. How can the business keep selling at the promised low prices? It's actually very simple. We have a business model and technology that works and is economically viable at scale. Once you are at $20 billion in top-line sales, then the full benefits of this new technology and business model make those prices work. If you know you have a business model and technology where these prices are sustainable, at some point in the future, the question is do you cover those losses until you get there or try to have higher prices today, in which case you may never get there? We opted for the former. E-commerce players can also be big advertising platforms. Do you have advertising? We do see that as an opportunity in the future. All the dollars that we earn from other avenues, like advertising, we'll take that back and give it to the consumer in terms of lower prices. We're actually talking about having another saving action through the checkout process. You could opt in to seeing banner ads as you shop. How about Jet.com? What's your marketing strategy? There is a TV campaign starting in September. We'll spend $100 million in the next 12 months with a lot of TV and display, including Facebook, as well as other channels.